We do not believe that, by any stretch of the imagination, we can be considered practical. Even in our otherwise reasonably distinguished schooldays, whilst others presented their proud parents with sausage plaits, tapestries and even wooden spice racks, neither of us succeeded in producing anything remotely edible, beautiful or useful. And unashamed as we were, and are, of our later gardening achievements, we were always happiest when dreaming up ideas for others to turn into a reality. It is, therefore, no wonder that we hold the greatest respect for those individuals who are masters or mistresses of their crafts. All of which takes us to our favourite Brighton delicatessen and coffee house, 'Artisan', a shrine to the delectable, the delicious and, importantly for us, the handmade. Here hand roasted Lazy José coffee is skilfully transformed into Lattés, Espressos, frothy Capuccinos and the 'on-trend' Flat Whites. Plump olives and sun dried tomatoes tempt in large white bowls, quality oils and vinegars are decanted to order and handcrafted loaves of sour dough, rye and wholegrain are delivered daily from a family bakery in Hove. 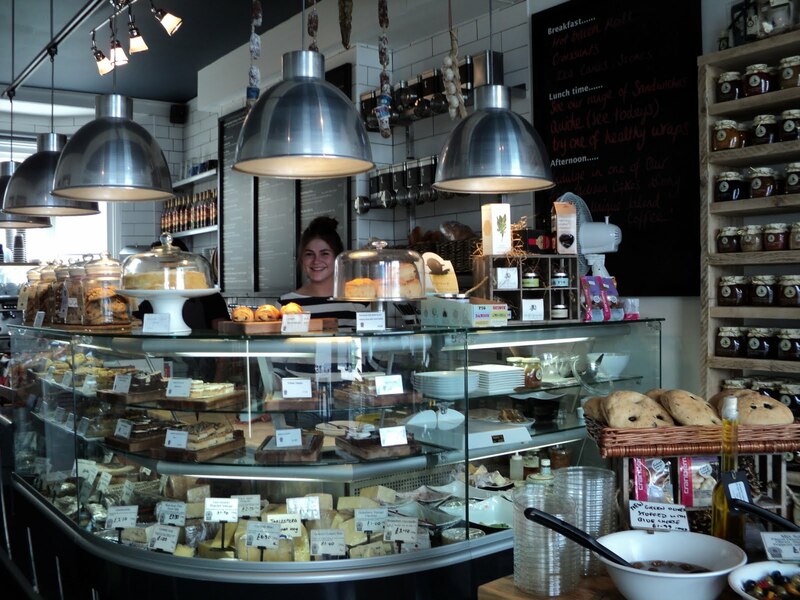 Award winning cheeses, slow roasted hams, spicy salamis and hand raised pies are testament to the knowledge that this is a shop which takes its food seriously. And from our favourite table in the window we consider how the 'Artisan' customers are every bit as individual and interesting as the delicacies which are on offer: a former pianist to the youthful Ivor Novello, a local food critic, artists, musicians, students, television personalities [or so we are told], and a ninety-two year old, retired civil servant who, accompanied by her dog, Bunty, hates cooking! For, although only in its first year of trading, former banking executive Simon and established painter Stephen, have, together with manager, David, within a very few months established 'Artisan' not only as a superb delicatessen and coffee house, but a meeting place for the wealth of creative talent for which Brighton is so well known. We are lucky, as we despair over our knitting needles, to count them as our friends. I am so glad you are back!!! Oh! Would that I could be within striking distance of 'Artisan,' as I would be right there at the counter with Bunty's owner--for I, too, am not fond of cooking (although I am an expert at my English mother's shortbread recipe...how hard can it be with only three ingredients?) . I am so glad you are back!!! :) Yea!! Thank you so much for your warm welcome. We have enjoyed ourselves enormously, visiting Artisan most days, but it is good to be back home in the Motherland! Shortbread, albeit with three ingredients, sounds way beyond our expertise. But, how wonderful it would be to meet up in Brighton and put the world to rights over a coffee!! What a wonderful place that must be! Every time I hear of a place like that which serves food as it should be served, I think of how good and healthy and clean it all is. I think with horror of all the masses of people who REGULARLY eat at fast food burger joints and the like over here in the US. I have never been to Kemp Town but when I was training as a welder, my Instructor used to sing "The Kemp Town Races" all the time. Is the racetrack near? We share your view entirely about nasty 'fast food joints' and really do not know why they are so popular as often the food is quite expensive and generally no faster than simple healthy food served with care. Yes, Kemp Town racecourse is very close by. A wonderful situation set high on the South Downs and just outside Brighton. You must try to visit one day! Now that looks a wonderful place to spend an hour or so on a regular basis - to enjoy a wonderful freshly brewed coffee, people watch, chew the fat with some interesting people, and then head home with some local specialities for lunch - perfect! How fortunate to have discovered this, and I can imagine you both in your element there! And modest too - what could be more practical and beautiful than the gardens you have both created, and the books you have written?!! Thankyou for visiting my blog and for leaving a comment - Pembrokeshire is still so surprisingly unspoilt even in August, and the coastal path is supposed to be one of the best in Britain - it was mentioned as one of the top coastal walks (particularly Stackpole Head)in last weeks Saturday Times - indeed the paper goes so far as to say it is named (by whom? )as one of the WORLD'S most beautiful walks!!!!!! High praise indeed, and sure to be disputed!! Yes, Artisan is indeed perfect for all those activities which you list here and, we have to say, many happy hours have been spent in there this past week. How kind and generous you are about the gardening and books. At the time we found it all to be great fun and a wonderfully creative outlet, although incredibly hard work. Praise indeed for Pembrokeshire in the Times. Well, for our own part we should certainly regard it as one of the most beautiful parts of the UK. For many years, the gorgeous Dame Anna Neagle lived in Kemp Town. I never met her, but my Grandfather claimed he did, when he took his Spagfthorpe Lightning sprint bike to Brighton for the Speed Trials on Madeira Drive. Welcome back, yep Artisan is a lovely place, I just adore the aroma of the place. I used to love Bona Fide on St James Street too. But it had a change a while back, but some lovely homemade pies and other things in pastry! I'm with Gillyflower... it's just the kind of place I love. Unassuming but full of quality items and oozing the care and attention of the owners... that's as it should be. We just had a restaurant critic despair at the poor quality of service in restaurants these days as he wondered at his own fault for letting places get away with murder. Good to know that there are still new places that don't just grunt and throw things at you!! ps what is a flat white??? *sigh happily* There is something as special about homemade, non-industrialised food as there was about hand-crafted, non-mass produced art. The great taste, the nutritional values, the respect it gives to the creator, saving limited resources... all important. There are so many wonderful English cheeses, aren't there? Many made on a very small scale. Unfortunately, they can be hard to source. What a marvellous shop, I could spend hours, and a lot of money there! Clicking the pictures made everything look so delicious. I could see my favourite cheese - Cornish Yarg. Do you know why it is called Cornish Yarg - it is made in Cornwall, obviously, by a Mr. Gray - Yarg is Gray spelt backwards. We are fortunate in the UK that so many of these gorgeous little shops are opening up now. Very pleased that you are back again. Soooo happy to have you back! 'Artisan' looks like just the place I would visit on a weekly if not semi-weekly basis-- and what a suitable name. I can practically smell the place based on your description as I munch on an ill-advised bowl of Cocoa Krispies to stave off a nosedive in my blood sugar levels as I wait for my husband to come home so we can share a proper meal! And I'm absolutely certain that you are too modest regards your own talents! Ah, this is what I miss the most about living in Marin County, California--such places as the Artisan. I would love very much to order some scrumptious sandwich and then take home some great cheese and wine. It is so good to have you back! Lovely deli. there are so many good ones around these days. We seem to be finding them all the time in Suffolk, too. It is we who are lucky, as we despair over our own knitting needles, to find you back in the saddle again, at the forefront of all that is exquisite and interesting in this ever-changing world. Oops, look at that, we've dropped a stitch in our rapture of delight at your return. Scrumpy. I had to google it. Cider? Well, that would not be sold by the gram. Ah, add the Sussex. Unpasteurised cheese with cider in it. The shop looks very fine. I was so happy to see your post again. You were missed. For a store to be stocked so well, it must be doing very well. I have noticed that in similar stores around here, the choices are not as plentiful as they once were. Just looking at the counters and listening to your descriptions make me hungry. I'll have a Frankie Valley sandwich and some regular hot chocolate, please. I hope I can visit that shop some day! Welcome back! I also love 'artisanal' locally-made goods - the quality is almost always superior to mass-produced goods and it is great to support the local economy. This delicatessen/coffee house looks like just the sort of place I like to go to for a bite to eat or to browse for special ingredients to take home. Thanks for sharing this! What a lovely delicatessen, and if I were in the area it is definitely an establishment that I would frequent! My good childhood friend's nephew opened up a thriving pizzeria in Florida after he rec'd his MBA. He is living his dream! Sounds like a delightful place to meet interesting characters for wonderful conversations and enjoy some fabulous tastes. I have never heard of Flat Whites. Wonderful to see you back. I always find it most interesting to judge a cafe/ restaurant by the kind of people who frequent it. Or maybe it is just simply that I love people watching! But it is great fun to see who eats where, and what they choose. It creates as much atmosphere in a cafe as the interior design itself, I reckon. Artisan sounds delicious and right down my street - lots of handmade, carefully produced food of simple and robust flavours. No wonder it has become popular so quickly. What a marvelous place--everything so lovingly chosen and prepared and beautifully displayed. Very inspiring! I love those rustic shelves with jars of preserves (or honey?) on them. I would not be able to resist taking home a loaf of rye bread--after I had spent an hour drinking coffee, eating one of those delicious baked goods, and watching the characters of Brighton pass by. And thank for posting a picture of Sussex Scrumpy--I have never read or said scrumpy before and it made me smile. Remember me? I know, how could you possibly forget a shy, humble and unassuming chap such as my good self, who endeavours to leave rambling, disjointed and bordering on nonsensical, comments. Anyway, my new illustrious and charming friends, I shall now delight you with my eagerly anticipated reaction to this posting about Brighton and your favourite (or 'favorite' for your American fans) delicatessen, 'Artisan'. Well, hello deli. That looks like a fascinating place to spend some quality time enjoying what's on offer, sipping on a frothy coffee and watching the activity of humanity pass by. I remember being in Brighton when I was just a little lad. Sweet, innocent lad, of course. I recall the beach being rather pebbly and had a heck of a time building a sand castle. Nice to see you have spent some time back in Brighton. I've no doubt the parade in your honour was a huge success, with clowns, jugglers, marching bands, balloons, lots of pretty balloons and fourteen horses. Of course, I was offered to be at the back of the parade with the bucket and shovel. Cannot believe I'm doing this. I've ticked 'email follow-up comments' Sorry email account. Thank you for such an excellent article. So lovely to see a post from you this evening. Artisan sounds like an absolutely delightful place. I just love businesses that are privately owned and operated with professionalism and passion. This is the type of establishment one never tires of. Oh the cheeses and olives look so tempting. I can imagine the wonderful conversations also. Welcome back - I was wondering where you both were hiding yourselves! Artisan looks superb -just my cup of tea (or coffee). Anywhere with a super selection of cheeses is a star in my book. How long before Artisan Budapest opens it's doors? That looks like our kind of place! Yum! What a splendid place this is, and I love the name! Enjoy! Oh lucky you to be friends with the delicatessen "crew". So glad that you are back! Girl Wizard and I were lamenting your absence this very afternoon. This, exactly, is the sort of place I own in my dreams. Absolutely lovely! This looks like a delicious place to visit! And are those jams or jellies I see in that photograph of the front door? And that cheese selection. Wow. It would take me a week to decide on what to cart out of there! What a wonderful looking place. It is exactly the type of deli/cafe that is my ideal. mark & I were recently discussing a trip to Brighton and if it comes off we will certainly look it up. One of the things I love about blogging is that we learn so much about life in other places! I've not visited our Brighton home for many years, so Artisan would be new to me; it looks wonderful. Another favourite is Taj opposite Waitrose in Western Rd. We really are spoiled for choice in Brighton. How very splendid all of this sounds to have been. It is quite extraordinary the number of well known, if not famous, people who have been attracted by Brighton as a place in which to live. Blue Plaques are to be found everywhere throughout the City. Perhaps our paths may well cross in Artisan one day. Bona Foodie, on St. James' Street, does appear to have changed hands and is not at all the same as it was some years back. As for the one originally in Kemp Town, well that, as you will know, has disappeared altogether - its successor being rather dreadful in our view. We are indeed most fortunate to have Artisan just around the corner from where we have our Brighton apartment, and are tempted most days to be in it. Yes, perhaps restaurant critics are too anxious to curry [no pun intended] favour when they write their reviews and so, as a result, there is something of a lack of honesty. You are so right in what you say here and we rather like the parallels which you draw in this comment between hand produced food and other aspects of the Arts. Following up on your recent post, we did see the Duncan Grant/Vanessa Bell exhibition at the Brighton Art Gallery. Somewhat disappointing, we thought, as it was rather lacking in major works. However, we did visit Berwick Church [which contains their murals] which we loved and about which we shall post at some future point. It is very true what you say here about the number and variety of English cheeses many of which are quite regional which is, sadly, not typical of most British food. We really do feel that Artisan is a great asset to our particular part of Brighton and are so pleased that Simon and Stephen are doing so well in such a short time. As it happens we are once more back in Budapest where, it has to be said, we are enjoying the most wonderful summer weather once more. We found Brighton rather chilly, not helped by the ill fitting windows of our apartment! Faisal, you are really so very generous with your comment here, making absolute light of our total ineptitude at all things practical. However, whilst in Brighton we did buy, and then paint(!! ), a dresser for the kitchen of our dolls' house and were quite pleased with the result. What next, we wonder?! You've really got en eye for very special things and places! I will put the place first in the MUST DO List for my next visit. We'll be in London in October! Who knows, we might try to go one day to Brighton. I used to drive down a lot when I was living there. We had no idea at all why Cornish Yarg was so named and are so pleased to have learnt this. We think that Simon and Stephen most likely are unaware of this, so will most certainly pass on this piece of information when we next are in touch with them. We had dinner with them only last week and, had we known then, we should have been able to surprise and shock them with our knowledge of cheeses!! What a wonderful picture you paint here, Alec, of an erstwhile Brighton in all of its faded, and rather seedy, splendour [which is what we so enjoy about it]. And, yes, do you think that Maiden Aunts still exist? We, unlike you, belong to a generation where they were, when we were young, footloose, and fancy free, much in evidence but, sadly, this appears to be no longer the case or, most likely, they think of themselves very differently now. Sad for you that Mr. Sport was having none of it!! We were most interested to read what you say here, Susan, about the make up of Nelson. We imagine that all of those people escaping National Service [as we should call it] in the past have turned out to be highly interesting, intelligent and creative people to have as neighbours. Your fruit bowl sounds to us to be very well stocked for a delicious in between meals snack! Thank you for such a warm welcome on our return to the Blogosphere! We fully intended to post and keep up whilst in Brighton but the time simply flew by doing, it has to be said, all manner of delicious and interesting things [some of which will be posted about in due course] and catching up with friends. Your snack before dinner sounds rather goodly, and so much more interesting than an apple! Looks like Artisan is on to a winner - very inviting! I tend to refer to lovely places such as these as gathering places. Somewhere you would happily gather on a regular basis with others who have the same appreciation of the loving care and attention that goes into any handmade produce. How lucky your corner of Brighton is to have such a place - long may Artisan be appreciated and supported! Do not talk of chewing gum on pavements!! If the streets of London are, by repute, paved in gold, then those of Brighton are steeped in gum. Absolutely disgusting! As for smoking outside, one of the receptionists at our doctor's surgery spends more time outside with a cigarette than at her desk. Some advertisement! Having spent the greater part of the day in Artisan, we very often do, in fact, take something home with us for supper. Their pies and tarts are absolutely delicious and really are, and taste, homemade. We are certain that you would become a regular in no time at all. Thank you for the welcome on our return. Yes, we do so agree that, compared with some years ago, it is now possible to find interesting food shops in so many parts of Britain. Is it that, at last, people are beginning to take what they eat more seriously? Suffolk is a county which we know only slightly and one which, in the future, we much wish to spend time exploring. We are, indeed, most fortunate to have so many good places for coffee both in Brighton and in Budapest although, it has to be said, that when in the UK, then Artisan is our all time favourite. David, the manager, runs, as they say, a very tight, but hugely friendly, ship! Dear Mise, how really kind and generous you always are. Would, in truth, it were simply a matter in our case of mastering knitting when, possibly, we might feel able to hold up our heads in a crowd. But, alas, we are far from that point. First must come the boiling of an egg, followed by the changing of a plug, and then we may be ready to graduate to a hammer and some nails. But that is leaping ahead. Today it is attempting to type on the keyboard using more than one finger. We joke not!! 'Scrumpy' is, don't you think, such a delightful and delicious sounding word for cider, conjuring up all manner of antics in the hayfields and orchards by the youth of the country fired up on this wonderful summer drink? And the cheese is equally good too! We are, as you may well imagine, delighted that Simon and Stephen are doing so well for they have both worked very hard at this new business and these are, as we are all so well aware, not the easiest of times. But yes, we agree, it is so important to keep the shelves fully stocked as this does, in turn, give a feeling of well being and of a shop being there to stay. And, Arleen, thank you so much for saying we were missed. It is so very kind of you. How strange that you should pick out a Frankie Valley sandwich for it is one of our absolute favourites - delicious, not least for some wonderful chutney which is part of it. That and a salad of leaves and you have the most perfect light lunch. We do so agree, Deborah, about how wonderful it is to find a bookshop which also serves coffee. A perfect combination in our view. We have a superb one very close to where we are in Budapest where the part in which the coffee is served is a restored C19 ballroom! Norwich has long been on our list of cities to visit in the UK. Some years back, whilst having a few days in Norfolk, we visited Blickling which we positively loved. We really do think that you would love Artisan too - wonderful food, excellent coffee [and tea too], and, most importantly, a very welcoming and friendly atmosphere and masses of interesting customers. We spend rather too much time there when in Brighton. Thank you for such a warm welcome on our return. Artisan is, we feel, very much your sort of place with plenty of Savoir Faire about it. How wonderful to attempt to make your own cheese which, even if it did not turn out exactly, we are certain was delicious. It is surprising the number of graduates who, trained in one of the professions, choose, like your friend, to open their own small, independent business for what can be a much more satisfying lifestyle. Hard work, yes, but rewarding working for oneself. Looks like a cracking place - I shall have to put it on my list of 'places to go to in Brighton'. Yes, you are absolutely right. These are exactly the reasons why we love going to Artisan. We believe that the 'flat white' has its origins in Australia but it certainly appears to be the flavour of the moment in coffee shops. We have yet to see it in Budapest though!! Brighton is certainly a city of contrasts. Something for everyone we think and always something of interest taking place. Our favourite phrase is, "It could only happen in Brighton!!" It is interesting that Artisan draws people from a wide variety of backgrounds but all of whom, like us, enjoy good food presented well. Often the topic of conversation will be food which does reflect the fact that the customers are, we think, serious about where their food comes from and its taste. And yes, Virginia, to have become popular so quickly in spite of the intense local competition shows that Artisan is offering something special which people are pleased to have discovered. Ourselves included!! Simon and Stephen will be pleased that you spotted the shelves which they had specially made for the shop. As you say, the homemade jams, chutneys and honey look very good displayed on them. 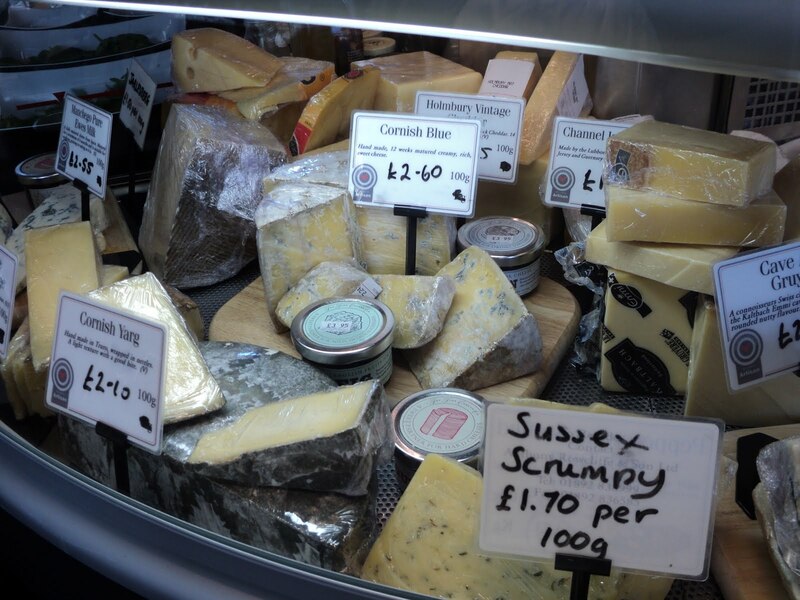 The cheeses are all award winning varieties, many of them locally sourced. The 'Sussex Scrumpy' is delicious containing as it does the alcoholic Scrumpy which is a form of cider. Hello Gary, how could we possibly forget one of our favourite commentators?!! Indeed, a comment from you is almost a post in itself!! Yes, Brighton beach is very pebbly so sandcastles are out of the question. Indeed, even shell collecting is tricky as we find there are very few shells washed to the shore. Although not, sadly, in our honour, the annual Gay Pride Parade was held whilst we were in Brighton. An amazing sight with over 30,000 party goers attending the concert and countless thousands of watchers-on lining the streets. So very different from Budapest a few weeks ago where riot police with tear gas 'controlled' the non-existent crowds and the hundred or so brave Gay Pride paraders. So sad. Oh my, there is not much to say that hasn't already been said. :) Yes, I had to get up immediately to get a piece of toast with jam after reading this, yes, I was delighted by the idea of "scrumpy" (even more so after reading that it contains cider) and yes, I think that I would be there every day! I just wish we had a place as cozy and welcoming here. The terraces of French cafés are lovely but more about being seen than actual looking, let alone talking. And certainly no delicious offerings, just foamy coffees. Oh, for Artisan Arles! While I was a student in New York, I actually worked for a summer at Dean & Deluca, the motherlode of delis. There was an entire black market where employees secretly traded damaged goods and as I worked in the cookies department, I was much sought after. I was terribly poor at the time and so was delighted to take home cheese from the Pyrenees or chicken parmigiana! We are now returned from Brighton to Budapest and indeed so much time was spent in Artisan chatting the days away that there was no time for blogging!!! We are sure that you would love this coffee house/delicatessen and can just imagine how we should all be able to spend the whole day together gossiping and eating our way through the Artisan menu!! We hope, Helen, that you have enjoyed/are enjoying your well earned break by the seaside. Lazy summer days....there is really nothing to beat them is there?!! How well you seem to know us! Yes, if we go AWOL for any length of time then there is usually a coffee shop or restaurant involved to some extent. As lovers of good food yourselves, we are sure that you would spend time in Artisan too. And, funny you should mention Artisan Budapest, for when Simon and Stephen came to visit us in Budapest recently they just toyed with the possibility...!!! We are so pleased that you like the look of Artisan. Its slightly French touch would, we are sure, appeal!! Yes, everything about the place has been so very carefully considered. And, we agree with you, Irina, the name 'Artisan' is perfect. We think so too! They are all delightful, lively company and, when invited to dinner, bring the most delicious of gifts!!! When in Brighton, we do exactly that!! The shop is very close to our 'rooms' and so it is perfect for supplying morning coffee, a delicious take-away lunch and, more often than not a wonderful afternoon tea. Such a pity that they do not serve dinner!!! Aha...talking behind our backs eh!!! Well, as we always say, "So much better to be talked about than never to be mentioned at all"!! As for owning an Artisan, well we should, we know, be totally hopeless. Since we should probably eat all the profits and we have no clue as to how the very splendid looking [but frightening] coffee making machine works!! Better to leave it to the experts in our view. Jams, jellies, chutneys, honeys, onion marmalade....an amazing variety of produce is contained within those stylish glass jars. And, as you say, deciding what to have is a real problem, especially as every week there is usually something new on the shelves to tempt one. Thank you so much for your warm welcome. We do hope that you will make a trip to Brighton as it is always such fun. And yes, a visit to Artisan and indeed many other small independent shops in Kemp Town would, we are sure, be of interest. Yes, perhaps a return visit to Brighton would be fun as there are so many new things to see which have appeared in recent years. Fortunately, the Taj opposite Waitrose is still there but, sadly, the one which was at the bottom of St James' Street has been replaced with a Sainsbury's. Oh dear!! You are so right. There is a great sense of well-being about places such as this where one knows that real care is taken not only to choose the delicious food on offer but also to serve it with a smile. And yes, performance art is quite the phrase for the operation of the all singing, all dancing Italian coffee machine!! Yes, if Artisan were to be summed up in one word, then 'delectable' would be an excellent choice! Some of our friends would say that it is our lifetime's work [or indeed only work]selecting and sampling coffee houses!! A day trip to Brighton sounds a lovely idea when you are in London. Fast trains are plentiful and, whatever the time of year, there is always something to amuse and interest in 'London Sur Mer' as Brighton is often fondly known. We do love just going in, seeing what looks good that day and eating it for lunch or supper. We are rather fond of pies and tarts and there is always a mouthwatering selection to choose from. We do feel very fortunate that Artisan is so close that we can visit every day and indeed many other 'regulars' do just that. It is very much a local gathering place, almost a well guarded Kemp Town secret, and does seem to attract a particularly lively and creative crowd. As an artisan yourself, making the most beautiful handmade products, we know that you would share our enthusiasm for food which is made with care. And, of course, it enables us to be out of the kitchen, somewhere we try to avoid as you know!! We agree, Diane.Places such as Artisan do indeed deserve to be cherished as they are such a wonderful asset to the community which they serve. Oh dear, how awful your 'off the road' experience sounds to have been. We have to say that we are rarely to be found at the Marina since, somehow, we never seem to find anywhere that we are entirely happy with. But yes, when next in Brighton, give Kemp Town another try with Artisan, Brampton's butchers, the Kemp Town Bookshop, various antique shops [including a newly opened one]and the Marie Curie charity shop on your list. Hopefully, they will not disappoint. Artisan Arles....now there is an idea. Perhaps if Simon or Stephen read this they will be tempted. Rather a challenge to beat the French at their own game, so to speak, but perhaps a little English competition would sharpen their game? Dean and Deluca sounds to be an emporium of delight. New York is definitely on our itinerary one day and so we need to be establishing our list of must to visit places in readiness. We are sure that this would be a certainty. The weather had turned rather autumnal in England but, back in Budapest we are enjoying wall to wall blue skies and sunshine. Summer is still here we are pleased to say. Enjoy a lovely weekend!! Scratch and sniff blog posts....that could really catch on we think!! And, Miss Scarlet, we are sure that you will be pleased to know that Artisan has a loo which would meet all your exacting standards. Small, but perfectly formed and equipped!! ...I was going to ask about the loo! Probably best if that isn't scratch and sniff though. While I'm a long time bakery devotee (the unkind would say something FAR more crude!) of the wonderful bakeries of OZ, this looks like it'd give our best a run for its money! Lucky you!! I love these eclectic, individual places. There is one in Cardiff I blogged about, Waterloo Gardens. 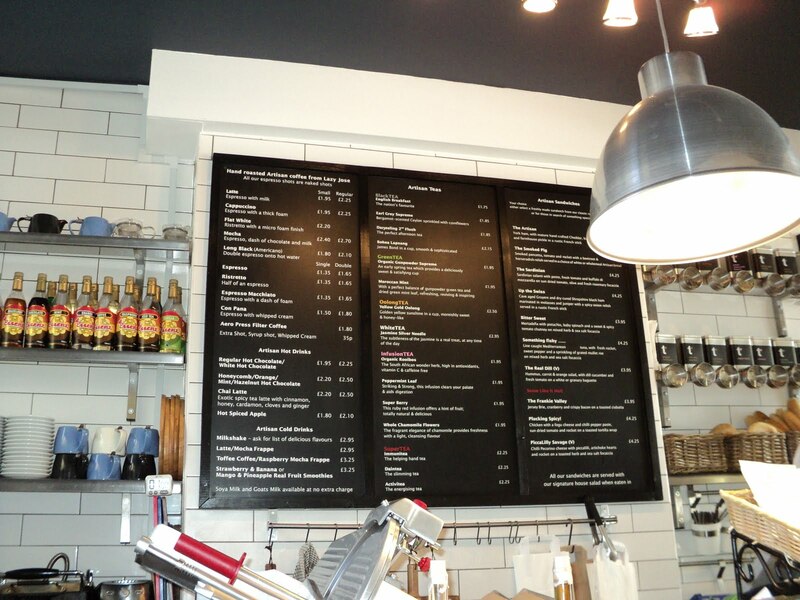 They can offer so much more that the formulaic chain coffee houses. When you go into Waterloo Gardens you never know what flavour of cake they dreamt up overnight! It's wonderful and keeps it fresh. What a wonderfully enticing looking place!! The cheeses would draw me in! Being in a lively place like that is so electric, so much fun to sit and take in all the sights of the passerbys and sounds and smells of the wonderful foods permeating the air! Helen needs to know - does such a place frown on one pressing one's nose against the glass and drooling? Because if they are not open to that, Helen will have to stay away. It looks just lovely. Even as we wrote about a scratch and sniff facility we were beginning to regret it. These days there is always someone who will go just too far and then there will be tears before bedtime!!! Your friend MJ sounds most intriguing, we shall sniff her out!! Having introduced us to the dubious delights of Kopi Luwak, we fully realise that anything else presenting itself as coffee is bound to be a disappointment. Still, we are delighted to note that Artisan sells your coffee of choice and, on a positive note, you do not have to scale a mountain to partake of the pleasure of the Flat White, even if it is behind the Australian curve!! Thank you so much for your warm welcome. Sadly, we must have missed your post on Waterloo Gardens but it does sound to be exactly the kind of place we love too. As you say, it is the individuality of these independent shops that one appreciates, so far removed and so much more preferable, in our view, from the sameness of high street chains. Yes, we do so agree, that it is the easy availability and warm welcome in addition to the delicious goodies on offer, which make Artisan such a gem of a place for us. The cheese selection is indeed a delight. We like the fact that as well as the hard working stalwarts of the cheese world, there are always some new varieties to try out. In addition, as many of the cheeses are locally made by small producers one does not see them routinely for sale . Pressing a nose against the glass and drooling is common amongst the Artisan clientele. You would fit in beautifully!! This place is my idea of heaven...love the cheese labeled 'Sussex Scrumpy'! I want to try it! Such a pity that the Sussex Scrumpy is a local English handmade cheese. This just means that you will have to visit Brighton one day to sample it!! We shall be pleased to welcome you and show you around when you do!!! It's good to have you back with us ( oh goodness, that sounds as if you've both been in a coma !! )I hope that you've had a really good time away and enjoyed a change of scenery and a lot of R&R. Brighton is so fresh in my mind as I have only just been there, as you know. I wish that I had known about Artisan. My sister and I could have bought armfuls of delicious deli products to take home with us ! It looks like a wonderful deli....full of delicious and interesting foodstuffs. Simon and David have done a great job. We are off to Crouch End in a minute to meet our daughter and have dinner later. Crouch End is a haunt of actors and musicians, Bob Dylan being one of them.....if you can name drop then so can I !! haha. I was out to lunch at the pub yesterday and Cecil Parkinson, former politician and cabinet minister, was sitting at the next table ! Thank you for this vicarious stroll around Brighton. A great refutation of the "bland British food" myth, if that is even around any more. As a big Stephen Foster fan, I got a kick out of that line in the comments about "The Kemp Town Races". Have happy and healthy days ahead. I love dining in such places, not just for the atmosphere and good food, and not just because I don't enjoy cooking, but also because I love watching people. I suspect you enjoy watching that strange species, too. Thank you so much for your warm welcome. We were separated from our computer for over a week and although we very much enjoyed the break, it is good to be back in touch. Yes, we are sure that Artisan would be exactly your kind of place, so many good things to eat and drink and Patsy Palmer is a regular if that is a recommendation!! Perhaps on your next visit, you might be interested in seeking Artisan out. We did see the Duncan Grant/Vanessa Bell exhibition but, sadly, were rather underwhelmed by it all. However, there are some interesting works but we should have liked more [unusual this as usually we think there is too much]. Enjoy your dinner in Crouch End. Cecil Parkinson at lunch, so who knows at dinner!! We found the scenes of devastation after the riots in South london appalling, but everything seemed to be getting back to normal when we left. So very sad! How delightful, your post makes me want to stop in and sit a spell. I much prefer the local coffee houses over the chains, they put part of themselves into everything and it shows. Certainly it is true that Artisan is one of many good quality food stores that one can find in Britain today. However, bland or just bad British food is still far too common in our experience. Yes, just the mention of Kemp Town Races generally has someone 'doo dahhing' along, although Stephen Foster's iconic song is Camp Town Races which, when one considers the local residents of Kemp Town is not too far off the mark!!! Perhaps what you say here is the essence of a memorable food experience whether in one's own home, in a café or a restaurant.Ingredients need to be chosen with care and the food prepared with passion, then the taste is surely bound to please. Thank you so much for your warm comment. We wish you a happy and relaxing weekend! How well you know us!! Sometimes we think that we could obtain a degree in people watching, and the whole activity is made so much more pleasant with a decent cup of coffee and a delicious slice of cake. We totally agree!! It is that individual, personal touch that makes all the difference And, in our view, this applies to many,many things and not just coffee shops. Very much our kind of place!! Yum. You brought a huge smile to my face reminiscing about creative efforts at school. My only attempt was a set of placemats with crosstich borders which were doomed never to be finished--I never got beyond one side of one placemet of a set of 4! Oh, we are so pleased to read that someone else shares in our lack of creative achievement at school. We were beginning to think that we were the only ones!! Cross stitch placemats does, however, seem very advanced to us. We are sure that you are being far too modest about your accomplishments!!! Ah, the little English cafe--a realization of my romantic vision of Britain! Would come just to meet Bunty! If only all English cafés were like Artisan, but and here we are sorry to dash your dreams, they are not.Bunty the West Highland Terrier is well worth a visit and perhaps 'Something fishy' from the menu for Macabry!!! You have made a compelling case for me to travel all the way from across the pond, for just one purpose; to visit "Artisan" in Brighton. I can smell the aromas of coffees, lattes, cheeses and breads right here in my study. Have missed your posts lately, welcome back. My mouth's totally watering over that pic of cheese:) Is that wrong? Oh, welcome back! And you do come back roaring with this delicious post. May I please go there now? How wonderful it would be to meet and chat over a latte at Artisan!! Perhaps one day.... or just maybe we shall cross the Atlantic and should wish to know of your favourite coffee shop. Thank you so much for your warm and generous comment. It is good to be in touch again. We have missed everyone! No, not wrong at all. We spent the best part of a week doing just that [and eating, and drinking, of course]!! One never does know quite who will be in the shop to talk to but, more often than not, there is somebody with an unusual take on things. And yes, choosing what to have is half the fun but if unsure then something can be eaten in for lunch and something else taken away for supper!! We are missing it all already!! Thank you so much for your generous comment and warm welcome. It is good to be back!! Oh, that looks lovely, I would love to visit it. I have been to London but not to Brighton, I've heard that it's a gorgeous place. What a wonderful place to sit and sip a good coffee. I love to sit in coffee shops and people watch. This looks a particularily lovely one. England has at last woken up to the delights of the Deli, long may it last. Brighton is a very vibrant seaside town with such good links to London that it is often termed 'London sur Mer'!! We know fom your own blog that you are a food lover and we are sure that Artisan would be just the kind of place which you would enjoy. Yes, coffee drinking and people watching are definitely favourite activities of ours. And, if the customers are not able to amuse, then a good supply of magazines is also provided to while away the hours. Actually, it is a wonder that we ever leave before closing time!! Thank you, we are pleased to be back!! oh my sounds utterly wonderful....am visiting a friend in Worthing this weekend perhaps I can persuade him to take a trip to Brighton and seek out Artisan!! It's funny, the simple things one misses when living abroad. When I was in Britain this summer, all I really wanted was a ploughman's lunch or a freshly made cheese and pickle sandwich (sour dough bread would have been a bonus). Sadly, such delights seem to have been obliterated from the British menu. On the other hand, if I had found a place like Artisan, I might well have been persuaded to forget about Wensleydale cheese and celery stalks. How brave of Stephen and David to launch a delicatessen in such uncertain times. I do hope they succeed. Flat White: it's new to me. I wonder what it is. Glad to hear that you have found such a convivial 'local' in Brighton. Worthing...well, you will be just down the road so, yes, we should definitely suggest a trip to Brighton and, of course, a visit to Artisan. Kemp Town has a number of interesting independent shops so you could spend a happy hour or two there we are sure! It is always surprising to us how so very few places do anything simply and well, especially in the case of food. We feel very lucky to have Artisan as our local coffee shop and, happily, this view is shared by its many regulars. The term 'flat white' is, as far as we are aware, to do with the consistency of the 'foam' on top of the coffee. At one point it was all the rage in Australia but its days there seem to be numbered. In the UK, however, it is the coffee of the moment.Personally, our coffee of choice is a latté!! We are sure that Artisan would hold an appeal for you and do hope that you will be able to visit when next in the UK. You are right that it is a skilful blend of the traditional with the modern, with a keen eye for detail and quality in everything that is produced and sold. Well, how interesting that your Dutch magazines proclaim Brighton to be the 'in place'.We certainly feel that it has a lively buzz about it and is a wonderful melting pot of personalities and characters. But, only recently we read that the SS Rotterdam which you featured so recently in your own blog is THE place to eat in Rotterdam. We felt sure that this must be true as we had seen you there first!!! Linda, what a lovely greeting. We have missed you too!! Yes, Artisan would be just 'up your street' as they say and how marvellous it would be to meet up there for several coffees, cakes and a good gossip of course! Simon and Stephen have worked very hard and the shop is presented beautifully. They show the same degree of perfection in ther own home which is wonderful. But, times are difficult and we do think that it is so important to give whatever support one can to people who are trying to make a go of things in this brutal economic climate. That said, Artisan is thriving and the whole team deserves their success. I would give anything to have an Artisan mere blocks away -- or in this city at all, for that matter. How we wish that we had written 'a place where the best of food and the best of folk rub shoulders over something frothy'. It sums up Artisan perfectly! Yes, we do regard ourselves as very fortunate in having such a wonderful place close by. And, it is, of course, another good reason why we have no need to enter the kitchen!! Wishing you a wonderfully relaxing weekend! We are delighted to welcome you as a Follower and hope that you will continue to enjoy what we write. We were so pleased to have discovered your most eclectic and lively blog and shall look forward to future posts. WOW. I have lost all poetic ability at the moment to comment properly here, but I just want to thank you for your visit and most eloquent comments!!!! AND, I took a detour after reading your delightful post to visit your favorite illustrator; I am venturing out not only as a writer, but an illustrator as well! I have seen your comments around blogland and I am very honored that you have come to see me. LET US MEET AGAIN!!!! I take it you are British, living in Budapest? Yes, we are British and divide our time between Budapest and Brighton. However, it is our apartment in Budapest which we call home. We were so pleased to have found you and to sign up as Followers in order to stay in touch. Such a beautiful post accompanied by Debussy that although it is way past our bedtime, we could not pass by without commenting. We do so hope, Anita, that we shall welcome you back here again. Dearest Jane & Lance...you've been very much missed! You've worked your way into all of our hearts and blogland felt very amiss without your thoughtful comments and posts...but we also completely know the need for a blog-break every now and then, and you both deserved one more than anyone! If artisan was near my home, I think I would be there every single day...or at least I would try to be! It looks like the perfect place to people watch and to indulge wildly...with cheese and coffee of course! So nice to have you back...hope you had a lovely time away! I dream of delicatessens like this one. I love reading your descriptions as I enlarge each photo. I think I may give up cooking and eat every meal at this establishment if it were nearby. I would love to try the Bitter Sweet sandwich and those jars of jam lined up and the cheeses and olives, oh my!....I love everything about this place. Sounds like a lovely place! I miss a store like that here in Tallinn. But in a few months I will leave for Germany and there I think I will have a better chance of finding english marmalade and the cheese that I like. Have a nice weekend! Thank you, Jessica for such a warm and generous comment. It is true that we have enjoyed a break from the computer screen but it is equally the case that we have missed the friendly banter with our 'blog mates' as one of our Followers has coined them. When in Brighton these days we are always to be found in Artisan. It has a lively atmosphere and we are proud of our friends that they have established such a wonderful place in a few months. We hope that they continue to get the support that they deserve. Well,Annie, as it is our mission in life to give up cooking entirely [we have managed it in Budapest!! ], we need Artisan to provide the kind of food we enjoy without the work. There is, as you say, always something tempting to try as Simon is constantly searching for 'new lines' to keep everything looking fresh. But, such hard work. We consider ourselves very lucky that we can afford to simply eat, drink and be merry!! On the move again! What an interestingly nomadic life you lead. English marmalade, yes, we love it too and is one of very few items that we regularly bring to Budapest from England. Lea and Perrins Worcestershire Sauce, Twining's Breakfast Tea and Goddard's Silver Polish are the other main essentials!! Enjoy your time in Germany. We are sure that will find many splendid coffee houses to delight both you and us with there. Hi have just found you through Magnon. I may stand corrected if I am wrong but I have lived in Brighton and seen a million changes over my 65 years and never heard the race course called 'Kemp Town' I only know it as the 'Brighton Race Course' I remember it when you could bet outside all around the edge of the course, wonderful. The only coloured man I had ever seen in my youth was a colourful African man who used to give tips. I can hear him how shouting out, "I got a horse" I think he went by the name of Prince Honalulu or similar. Great Blog that I will revisit. Hold the phone...did I understand that you both have NEVER been to New York? Of ALL people? Now, after having lived there for 14 years, I can tell you without too much bias, that it is, simply, the finest town in the world. My goodness, what an itinerary could be created: the Frick Museum, drinks at the Monkey Bar, dinner at Café Boulud...sigh. If you ever do go, I will have so much fun making suggestions! And yes, I was actually serious about Artisan Arles. There is nothing at all like that here and with over a million tourists passing through per year, it is much needed! Off to the market! Glad to hear that you are home to sun. Hoping that Thea is whipping up something special. My dear Jane and Lance, Welcome back. It's so nice to see you back on here. Artisan in Kemp Town looks so Parisian. It's very chic and cosmopolitan. About 10 years ago, I went to visit Brighton. I have so many fond memories. A friend took me to Kemp Town because there is a fish shop (I can't remember what's it's called) but I think it's located in front of one of the pubs. An old gentleman came out from the back of the shop wearing a long white apron - similar to the ones you would see the traditional chefs wore in the old black and white pictures of boulangeries in Paris. Welcome back!!! You've been missed. This cafe looks just the kind of place I would go to. And I definitely will when i am next in Brighton. And I think I will take a window seat too. So great to discover new places that offer good products, good service and have interesting customers. Does that mean they've given up gardening? I adore Brighton, it's Ludlow-on-sea. We have several delicatessens, as you know, but not a large emporium of all things gourmet at Artisan seems to be. It's such a long time since I've visited, perhaps we should move there and leave the Shropshire Hills behind. Does that also mean that your days in Brighton are already over? This is just the sort of place I would love to have nearby. I'm afraid they would hate to see me coming through the door, as I would be identified as That Woman Who Drools on the Glass. I might be tempted to camp out in their parking lot. What a super shop, the kind I love to do my shopping in occasionally. It is easy to get carried away and spend rather a lot, but the experience is soooo much better than the supermarket dash. Annies agree on this one totally! A place to camp out in, to settle down and stay a while, to slowly and steadily try all that's on offer and enjoy the excellent company as a condiment. And even more appealing at this time of intense heat here in Jaen, where the idea of an English coffee house is almost too nostalgic to bear. I have been to Sussex twice within the past year - to Worthing both times. Your account of Artisan convinces me that a detour to Brighton should be on my itinerary next time round. Indeed, Why is it that I cannot for the life of me find you two on my blog roll (when you do produce one of your fabulous posts?) Here I am now, haha, I ad to hunt for you two! Many hugs to you both, and have yourselves a most wonderful weekend! Hi Jane and Lance, it's good to have you back. Thankyou for your warm wishes. I feel a little guilty as my birthday was way back in March, but what the heck I will enjoy it anyway! Glad the pics made you laugh. Love Linda x p.s. you are so right, it is important to support these wonderful shops in these difficult times. You are lucky to have 'Artisan' on your doorstep and they are lucky to have you! Mmmmm! I love these wonderful, beautifully crammed full of delicacy havens. They're like a little shelter from life - we go in and hide for a moment and are fed and nourished and leave happy. WonderfuL! I, also, appreciate those who understand the candy shop concept - shelves lined with every delicious and happy flavor that could be imagined. I feel the very same way as you do - glad that there are those with the creativity to invent such a force of atmosphere and delectableness! It is sooo great to see you back! I hope your vacation and trip were lovely. There aren't many Artisan food and shops in Toronto, unfortunately. Whenever I discover such places I feel like I won a lottery. How wonderful that you have dropped by since that has enabled us to find you! Racing at Kemp Town has always been how we have known of the racecourse and always in our minds associated [wrongly] with the Camp Town Races song by Stephen Foster. Prince Honalulu sounds like just our sort of person. We do not recall ever seeing him in Artisan, but you never know, one day....!! Yes, it is true, we have not YET visited New York. The long flight has always been our drawback but we have been saving our pennies for Cunard to deliver us there in style. We are sure that we should love NY and are certain that your suggestions would be just perfect. Who knows, perhaps we can even meet up there one day in one of selected coffee houses? What fun that would be. Artisan Arles and Artisan Budapest both sound like winners to us, but then we should only wish to sit in them and enjoy the food and drink. Managing one would be quite a different matter we suspect!!! And, a warm welcome back to you too!! We wonder if the Brighton fish shop you mention is in St James' Street? Certainly the old man who used to run it [he has since died and it is now in the hands of his son] used to wear the kind of apron that you describe here. Yes, we agree, Artisan does have a rather French feel about it as we see it. What particularly appeals to us is the way in which small, independent food producers from across Sussex are represented since our greatconcern is that these smaller producers are gradually being 'run out of town'!! Time for a visit to Brighton, dear ASD, and what fun it would be we think to meet up there one day!! There only is one window seat so you will have to be quick off the mark!! Although it is always difficult to make recommendatons, from what you write on your own blog about good food, we think that you would like Artisan. Whatever, Brighton is always worth a visit at any time of year and is so easy to access from London, so we hope that you will make the trip soon!! We are not quite sure who you think has given up the gardening, but if it is the boys at Bryansground to whom you refer, then no, they are still definitely gardening in those Shropshire Hills!!! We love Ludlow and if it had the sea then it would be a very close call as to which we would prefer between it and Brighton. Although there are other delicatessens with a wider range, what appeals to us about Artisan is the mix of a good food selection, good coffee and an eccentric clientele. Long may it continue!! Yes, our Brighton days [away from the computer]are now over and we are once more in the 30C+ temperatures of Budapest. We have been concerned to read that you have been a little low of late and if you would like a Budapest 'pick-me-up', then you know our email address!! Your comment made us smile! We are sure that not only would you be warmly welcomed you would find many kindred spirits to spend time with over a coffee. No parking, we are afraid, but you could always pitch your tent on the beach which isjust a few moments away!!! Yes, you are right! Increasingly, however, we find that as far as food is concerned we would rather have better quality in less quantity. But, we do try, as much as possible, to avoid supermarkets and support independent retailers whose numbers are sadly dwindling we fear. We suspect that there little treasures such as Artisan all over the world, it is just a question of seeking them out. Unfortunately, they may not always be in close reach of where one happens to be at the time. We are fortunate that we live just a short walk away from Artisan! The lack of a bakery is something we should miss very much, but your local coffee shop sounds lovely. We are sure that you treasure it and we know that we, lovers of coffee shops everywhere, would definitely be supporters. We are sure that Worthing has its merits, but we would venture to suggest that you might find Brighton rather more lively!! Certainly, we should suggest a detour next time you are in the area. You seek us here, you seek us there, you seek us everywhere....!!! How pleased we are that you do for we love to hear from you. Your Prague Deli sounds wonderful but we have not the faintest idea what a rumball is. As you say, when you feel that your custom is valued and that the food is chosen with care, it makes all the difference to the experience. With such a significant birthday, Linda, we feel that you are more than entitled to celebrate it the year round!! We do so hope that the birthday party will go well, but are sure that it will be filled with joy and laughter. Goodness knows where you found those amazing images, and we are still talking about the 'superman' dog!! So funny!! You make such interesting points here. It is so true that when one feels that after being in a certain place one comes out with a greater sense of well-being than when one entered, one wants to return time and time again. And yes, the creative spirit to create such a place.....it is to be admired, we agree!! We were most interested to read that you find Artisan-like places in Toronto rather thin on the ground whereas Kasia, another of our commentators who lives there, seems to have more luck. But, it is so true, that when one comes across what is the perfect place, then one does feel that one has won a very special prize!! What a wonderful post... and place. If we lived in Brighton, we'd be at Artisan every morning. We, too have never been accused of being practical! You have offered me a lovely tour of a place I have not visited. In fact, it makes me want to be there! Hello! What a very interesting place! Hi Lance & Jane, and welcome back to Budapest over there. Sorry I’m so late. Took me three days just to climb all the way down your comment tree here. Fell off twice too. Had to climb all the way back up again and start over. ‘Artisan’ is so very ‘me’. I’m infamously well known in my clan for being completely incapable of walking past any kind of food deli, anywhere, anytime, ever. This place looks like a foodies Aladdin’s Cave of utter joy. Heaven in a shop. I’m a devoted foodie, who has increasingly found himself having to journey to Europe to find such privately owned and run food pleasure palaces as this. It’s heart warming for me to see a special place like this crop up in our most colourful south coast city. Brighton is lucky to have them, and if ever in future they find themselves facing tough financial times, then Brighton should step in and help preserve them. Businesses like this are a retail art form in their own right. I’ve been a ten year fan of the ‘Oil & Vinegar’ product range, which originated in Holland. Tragically though, many of their Uk retail franchises have closed up due to financial pressures over the past five years. The nearest one to where we live in west Hampshire now is in Chichester. If this financially bereft country of ours doesn’t get its act together over the next ten years, we’re all going to run flat out of any choices at all, other than what Tesco’s decrees we shall buy from them. I have a lifelong ‘dreamy’ desire to develop my own jar food products. As I write these words this very moment I’m recording and partly listening to a foodie entrepreneurial TV show from the USA, for ongoing inspiration. If ever I manage to summon the courage and the wherewithal to ‘have a go’, I may well come begging to your door for an introduction to your friends Simon & Stephen here. Seriously! Thank you for recording and presenting this place for us all to share in Jane & Lance. Glad your trip went off so well in the end. Yes, we are sure that you would very much enjoy Artisan but will, no doubt, have great fun discovering your own Spanish equivalent. Perhaps the subject of some future post? We are, of course, delighted that you have enjoyed the post and very much appreciate your commenting. Maybe, some day, your travels will take you to Brighton, in which case you will be able to experience Artisan first hand! Artisan is, indeed, a most interesting shop and a very enjoyable place in which to have a coffee and a light lunch. We very much miss it when we are in Hungary. We do hope that you are having a happy Sunday! We are certainly singing from the same hymnsheet as far as food shopa are concerned. We notice every time we return to the UK that there seem to be fewer and fewer independent food retailers in every town and citywhich is a real pity since, at one point, we really felt that Britain was making giant strides forward in having more interesting 'foodie' places where eating and drinking was a pleasure rather than a chore. We may be wrong but we think that Artisan is the only place left in Brighton with the 'Oil and Vinegar' range. Such a good idea we think that you can buy them in whatever amounts you wish and can, therefore, try new varieties inexpensively. Your idea of your own 'foodie heaven' sounds fantastic, Phil, although we are sure that it is incredibly hard work. If you are serious, we are sure that Simon and Stephen would be pleased to give you the benefit of their hard earned food retailing experiences. thanks for your sweet visit today.if i would of known you were coming I would of had some coffee and baklava. ;) lol Have a beautiful sunday! If coffee and Baklava are on the menu we shall certainly be visiting again! We seem to remember this tasting delicious when we tried it many moons ago now. Does it have Greek ancestry?